No Bake Gluten Free Granola Bars | Great gluten free recipes for every occasion. 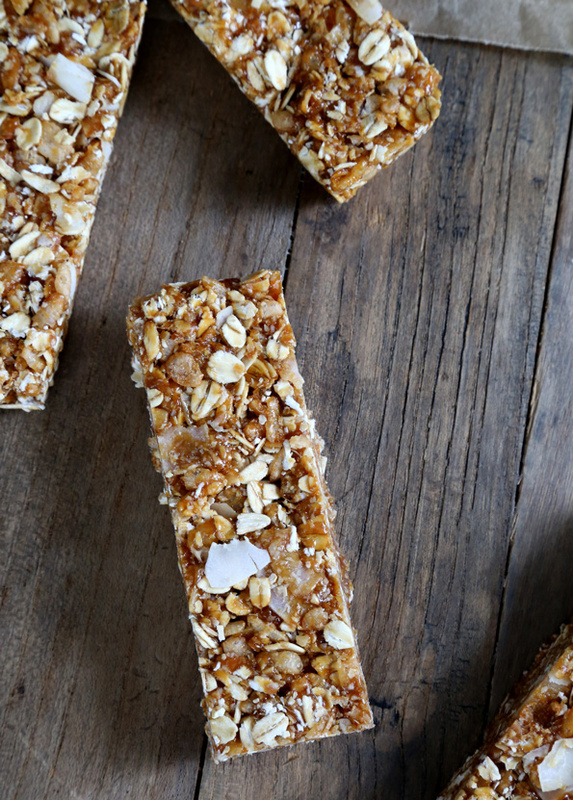 Highly portable, on-the-healthy-side no bake gluten free granola bars. Perfect for stashing away for snacking emergencies! Once you see how incredibly easy these bars are to make, you’ll be sure to always keep a stash on hand for those crazy busy school mornings when grab-and-go breakfast is all anyone can manage. (1) They have no nuts—unless you want to add some chopped nuts in place of, say, some of the coconut chips. So if you’re tired of super-nutty granola or just can’t have nuts, these are the granola bars for you. Not to mention that nuts are expensive. 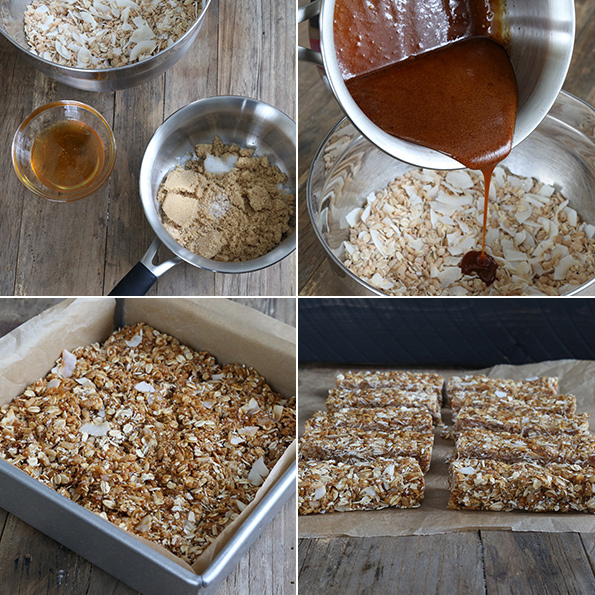 (3) I have made these bars so many times, in so many slightly different ways and I can proudly report … that you can replace the brown sugar in the recipe with an equal amount, by weight, of coconut palm sugar, a much more nutrient-dense, unrefined sugar. These are the granola bars that I stashed in my purse when we went to pick up my kids from a few weeks of sleepaway camp last week. And I have to choose carefully when I bring them food from home at a time like that. I’m happy to report that these highly portable, nearly nonperishable, on-the-healthy-side no bake granola bars went over very well with all 3 of my children. High fives all around! P.S. Which Gluten-Free on a Shoestring cookbooks do you have? There are 3! I hope you’ll consider picking them up today!! Hi. I am new to gf and to this blog. Is there any good substitute for the coconut in the granola bars? I am learning I now have to carry food for myself when we go to functions, but I am not a fan of coconut. As I am new to all this, other suggestions on portable food would be great. Thanks. I tried to make the granola bars you posted on your blog last night and I couldn’t get past melting the brown sugar. I have cooked all my life and used to teach at a college before my recent move, so I am not a newbie at this. At any rate, when I melt the brown sugar it just clumps and hardens, it never really melts into a liquid. I tried using a new bag of brown sugar, I tried adding the coconut oil first, then I tried adding it after words. It never blended together and I tried using a whisk. Nothing worked and I ruined two batches of that. Thankfully, I never added it to anything else so I didn’t waste everything. Any suggestions as to why this is happening and how I can fix it? Hi, Michelle, I understand that it can be frustrating when a recipe doesn’t turn out. I have made these at least half a dozen times, so I know that the recipe will turn out. My guess is that your heat was too high and/or that your pot doesn’t have a heavy bottom and doesn’t conduct heat very well so the sugar burned. I would turn down the flame and go slower. You’ll get there! My only other idea, Michelle, is to stir instead of leaving the mixture undisturbed. It may seem that the mixture has separated, but it doesn’t matter. Just mix it all in when you add it to the dry ingredients. These look really good. I’m the one who is gluten free so it doesn’t matter that the kids don’t like coconut. I picked up all three books and they are great. Thank you, Brian! And my kids love coconut chips, but we all don’t care for shredded coconut. If they haven’t tried coconut chips yet, it might be worth a shot! Those look scrumptious! I make granola bars nearly every two weeks and my recipe is similar except that I do bake them. Also, mine has nearly 1 cup more oil than yours (I use half butter/half coconut oil) but also only 1/3 cup of brown sugar to your 1 full cup. Now I’m curious what difference more sugar vs more butter would make. Any thoughts? 1 cup more oil is a lot of oil, Kristina! Feel free to experiment, but that sounds like it would yield greasy bars. You’re right! LOL! Sorry, I posted early in the morning and I wasn’t fully awake – I meant 1/2 cup more oil. My recipe: 3/4 cup butter, 1/2 cup honey, 1/3 cup brown sugar, 1 tsp vanilla, 1 cup flour, 4 cups oatmeal, 1 tsp baking soda, and 1 cup of add-ins. Plus it’s baked in a 9 x 13 pan, so they’re flatter than yours. I will try out your recipe for the next batch!! I dislike the texture of raw coconut, is there something I could add? You made mention that I could sub nuts, but how much? Have you ever tried coconut flakes, Jennifer? I dislike to texture of bagged shredded coconut. In fact, I dislike it a whole lot. I’ll leave it at that in deference to any reader who love it! But coconut chips are nothing like shredded coconut. If you’d like to try those, they’re wide, flat pieces of coconut (as you can see in the step by step photos above) and taste nothing like the shredded kind. If you’d like to sub in something else, feel free to experiment with the same amount of nuts by weight. I haven’t tried that, though, so I can’t promise it will turn out. These look so good and quick and NO NUTS! Thank you for sharing this recipe. I will be trying these very soon! Any suggestion for replacing oats? I would recommend googling a Paleo granola recipe, Kat. 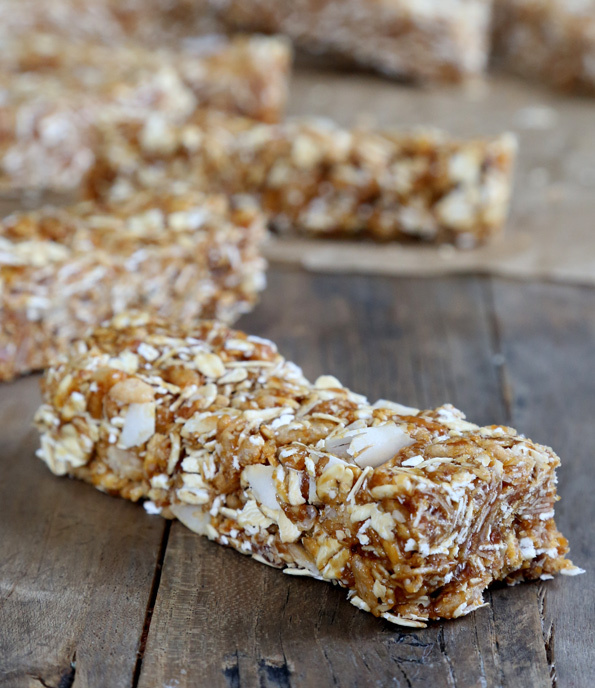 Rolled oats are the foundation of and most plentiful ingredient in these bars. Sorry! My daughters boyfriend is allergic to nuts, and is looking for a nut free protein bar. Do you think it would work to add in some protein powder to this recipe? I haven’t tried this with any more additions, but a protein powder is going to change the moisture balance. Feel free to experiment, Janell! These are exactly what i was looking for! Simple. Does the coconut oil leave much scent/flavor? I have a jar but i cant bring myself to use it on stuff because i dont like how it smells. Im not sure what, if anything, would be a good replacement for it in these. Hi, anna, I don’t find that it imparts much coconut flavor at all, but if you are at all concerned and really don’t like it, you can definitely use Spectrum nonhydrogenated vegetable shortening 1:1. Maple syrup is thinner than honey, Lady, so I wouldn’t recommend that. You could try reducing the maple syrup to the same viscosity as honey and then using it. Perfect timing on this one–yet again! Going away this weekend and want easy food to take for breakfast and snacks. I have to add nuts though…pecans most likely…because I love them! I am going to try it with dates in place of the brown sugar. I’ll let you know how they turn out. I don’t know about dates in place of brown sugar here, Mare. That’s quite a change. I’d really recommend trying coconut palm sugar if you want something unrefined in place of brown sugar. We are taking the girls camping in 4 days, was gonna make granola bars… of course you knew that! You could give it a shot, Rene. I don’t have a dehydrator so I haven’t tested that but they’re not really overly sticky.